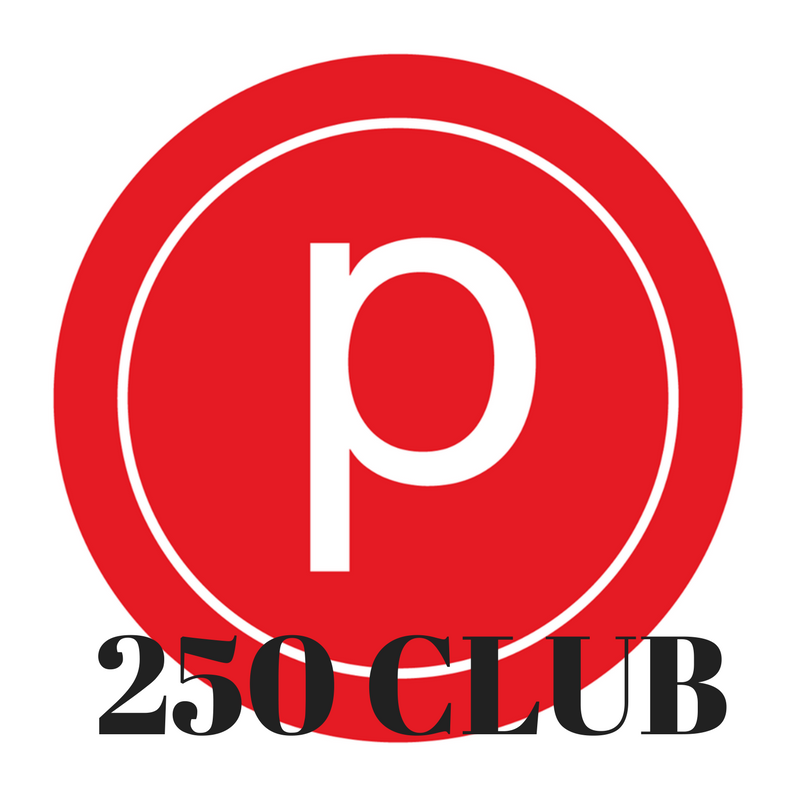 Fashionably Fit Femme: THE giveaway - fall fashionista style! We all know I'm pretty OBSESSED with Stella & Dot. Seriously, who wouldn't be!? For those of you unfamiliar with this brand, it's an accessories company that has gained so much notoriety for both its irresistible styles and its fabulous business plan. Consistently featured on celebrities, and in magazines like InStyle, People Style Watch, Redbook, US Weekly, to name a few - the fashion forward trends & designing genius' behind this brand, make it a coveted brand by MANY. This brand though, is NOT sold in stores. 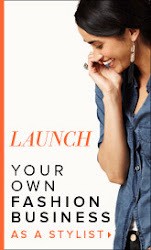 It's available exclusively through stylists via online or trunk shows. Don't know a stylist? You can be paired up with one through corporate! You don't have to know a stylist to shop the line. You can shop online 24/7. $125 SHOPPING SPREE to shop this new line! 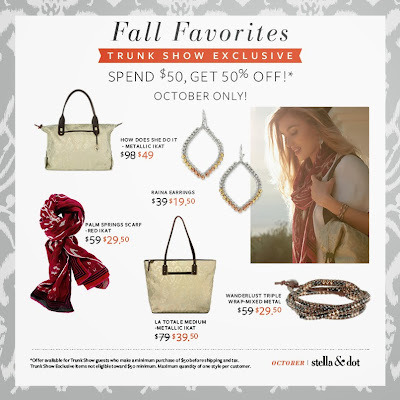 These items are available at HALF OFF with a qualifying $50 purchase! There is now a STACK UP PROGRAM to stock up on those gifts you have to give out yearly! Seriously! This is such a great idea and the items would make such cute stocking stuffers, "just because", and birthday gifts. Really, they are great gifts for any occasion. 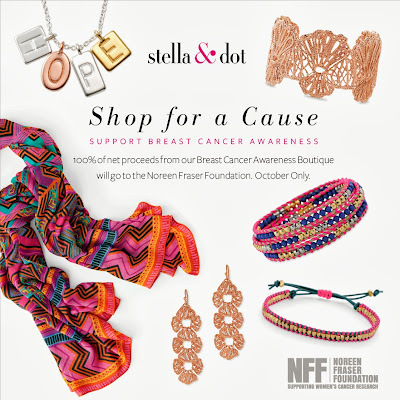 Another important thing to note, Stella & Dot is really big in philanthropy and has its own foundation. and children through economic and educational development. 100% of the net proceeds will go to our partner charities. 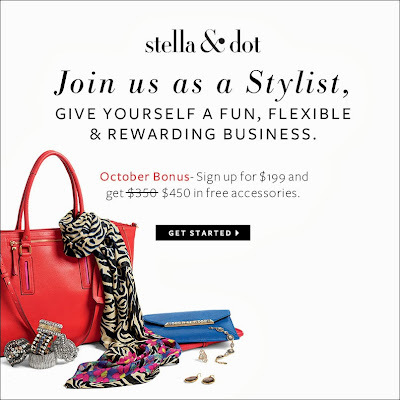 Stylists GLOBALLY, yes globally (Stella & Dot is present in the UK, Germany, Canada, and now FRANCE!) - are styling women in settings like their living rooms, offices, coffee shops, wine bars, ball fields, pretty much anywhere. 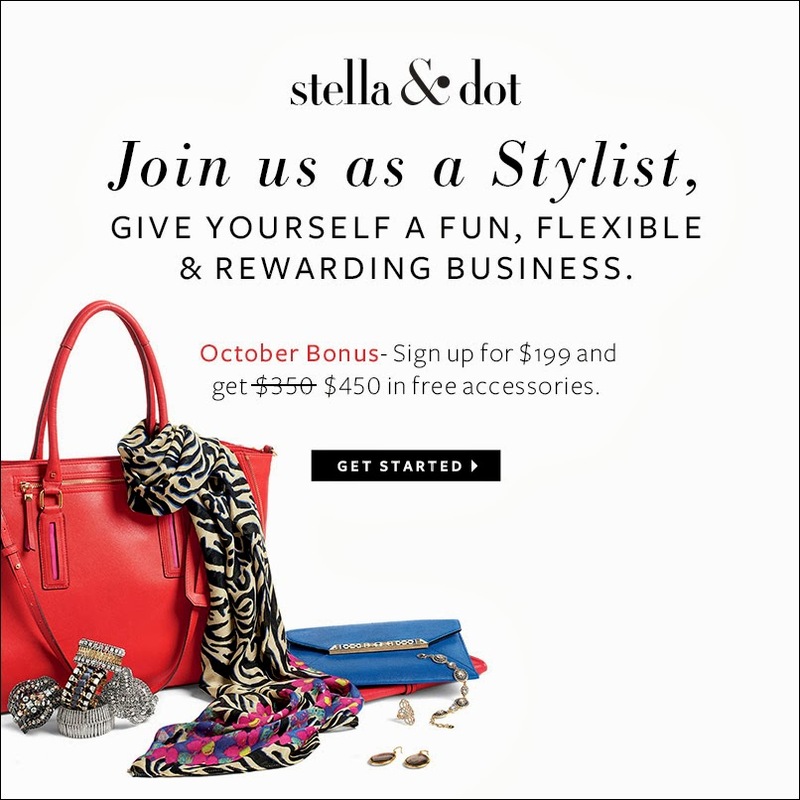 This month, new stylists are getting an EXTRA bonus! A $100 in product credit!!! Could the stylist opportunity be right for YOU? Want to start shopping now? Click HERE to be redirected to style! The Fall Fashionista Giveaway Event is hosted by The Chief Blonde at Still Blonde After All These Years http://stillblondeafteralltheseyears.com and Katy from ModlyChichttp://www.modlychic.com/. K Squared Glamour http://www.ksquaredglamour.org/ is our co-host! All Fashion! Only FASHION event! Largest Fashion Giveaway event on the internet with $26,000+ in prizes, 100+ participating blogs and 3/4 million entries. Each individual blog has a minimum of $125 prize! Some restrictions apply on the Stella & Dot offers. Winner will be notified of these restrictions & limitations. Certificate can not be redeemed towards a trunk show. Winner must place order through stylist mentioned by phone, email, or in person. Winner will be responsible for tax & shipping costs. Signature Hoops and other hoop earrings. I don't have any and really want some. I'd love the Olivia Bib Necklace! This is my entry for the grand prize giveaway as I do not reside in the US. I'd like a cute scarf and maybe some fun hoops!! It would be VERY hard to choose. I do like the DOT BLOOM NECKLACE. I would probably get a necklace and maybe a purse. anything in the new holiday line is great! I would love one of the tech wallets and the heart necklace that is "part" of the necklace!! Then I would def. get holiday gifts! So many great options, but perhaps the MALDIVES NECKLACE? Hard to choose just one or two items...love so many! I love that Wanderlust metal wrap bracelet! I don't know how I would chose because there are far too many options. Perhaps a gold necklace? Any of the earrings. really cute. I would get the Sutton necklace! I would probably get a bracelet! I'd get a new bag, because to this day I have never owned a nice one... just cheapo 20 dollar Target ones! One of the items I would get would be the Stackable Deco Rings.. really cute! The Love necklace is awesome! probably a scarf and bag! 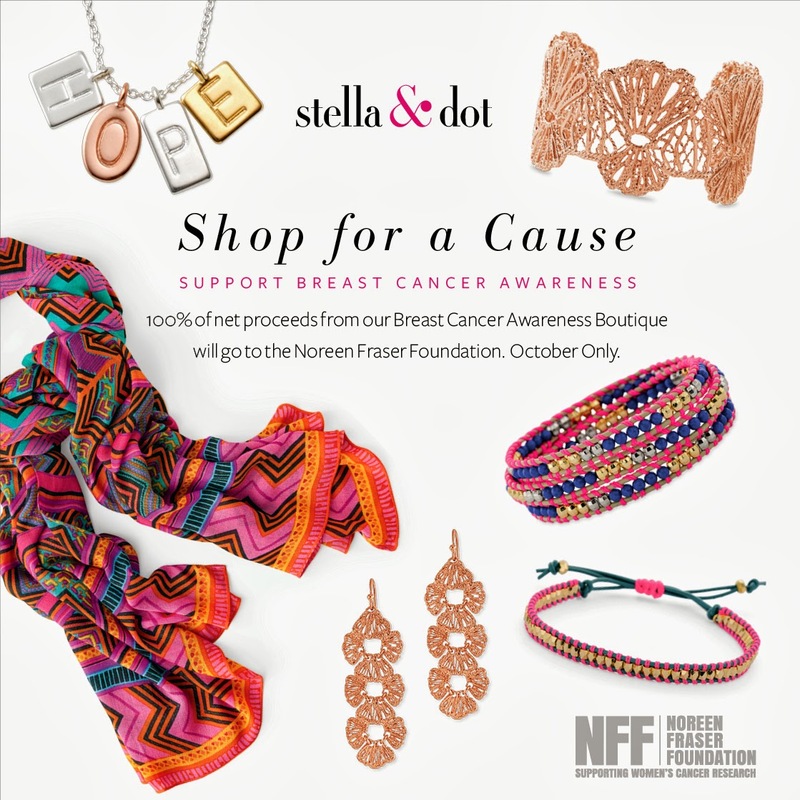 I will choose something from the Breast Cancer Awareness line as I am a 5 year breast cancer SURVIVOR!! Yay!!! I would get the Zora Crystal necklace. I am in love with the bracelets and the heart necklace! I would love a new pair of earrings or a fun pendant necklace. Thanks for a fun giveaway! Fun giveaway- just in time to style Fall fashion!! I would love to get a great mid length necklace or some earrings. I'm trying not to feel over accessories every time I put Jew,wry on. I'd get a new purse and a necklace! I would get the SUTTON NECKLACE. I would use it to get my daughter a Christmas presnet. I'd start with Lakin Teardrops and get myself a ton more new jewelry. I would get the Fine Line Earrings and maybe a scarf. I would get the serenity stone drops. I would get the Maldives Necklace! I love the turquoise, green and gold! I would get the Serenity Stone Drops. They are gorgeous. I would get the La Totale Medium in Navy Ikat and maybe some other jewelry items. Love it! So much cute stuff it's hard to choose! I like the Medina Chandeliers. I quite love their Silver & Labradorite Stackable Ring Band! would get the Tia cross body bag in black. I'll use it for holiday shopping for my niece. I know she would love a new bag. I would love the CHELSEA TECH WALLET - LEOPARD! I'd get the La Totale Medium! If I won, I would get the Eternal Band Ring and the Infinity charm necklace. I would get myself a purse! One thing I've been wanting is the gold renegade cluster bracelet! I love the paloma stacked ring! I just love the Luxembourg Scarf- Cerulean Tiger. I also really like the Paris Market Tote- Bright Cobalt but I would have to hostess to qualify for that one. I would geti love the Sommerville necklace and the charms! Ooh I could use a new leather bag!! I love the You Are My Sunshine necklace! I would get the Paris Market tote in cobalt blue. I would get the Love necklace! Definitley the Gloria Necklace, and any other piece of long layering jewelry! I like the tia cross body in midnight black. I like the Adelaide Hoops- Gold. I would also let my girls pick out something for each other. Any purse would be great! If I were the winner I'd love to get the How Does She Do It Pewter Metallic bag! I would love to get the The Classic handbag. The How Does She Do It - Navy Ikat bag is really nice. I think I'm LOVING that blue leather bag A LOT!! Thanks for the AWESOME giveaway! I'll get a new purse and maybe a scarf. Right now I am going to say the mercury necklace, but I adore their stuff and it would take me a week to decide. I would buy earrings and a cuff bracelet! i would get that blue purse in the ad. I would choose the "You are my sunshine" necklace - it's a song my daughter and I sing nightly. Beautiful. I would die for one of these phone cases!!! Love love love! I would llove to get a really nice winter scarf that actually looks good! Hello, I definately would get the Pyramid Double Wrap Bracelet. Thanks for a great giveaway! I'd really like to get the La Totale Medium - Navy Ikat. The maya pendant and a luxembourg scarf. I would get the Geneve Lace Cuff and the You Are My Sunshine necklace. I am planning on starting my Christmas shopping a little earlier this year. Really look forward to all the gifts I can get for others. I would get the Lucia necklace.